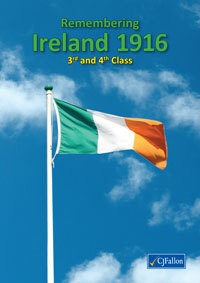 A commemorative book based on the events of the 1916 Easter Rising. CJ Fallon is delighted to introduce Remembering Ireland 1916, a commemorative book based on the events of the 1916 Easter Rising. It is an engaging 40 page, eight-unit book written by experienced primary school teachers. Two books are available – one for 3rd and 4th Class and one for 5th and 6th Class. • Fascinating facts and evidence from 1916. • Students a commemorative treasure of Ireland’s 100-year celebrations of 1916. CJ Fallon is pleased to present this commemorative publication and accompanying materials as its contribution to the Ireland 2016 Centenary Programme. Arrangements will be in place for classes using the books to have slide presentations and accompanying notes available to them.